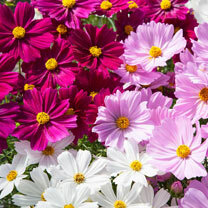 A compact, bushy cosmos with larger flowers and better petal quality than traditional varieties, therefore providing much greater impact in containers or the garden. It also makes an excellent cut flower. Flowers June-September. Height. 50-60cm (20-24).